New Media Investment Group (NYSE: NEWM) is a recent local newspaper/media spinoff of Newcastle Investment Corp (NYSE: NCT). It was formed as a result of Fortress/Newcastle's ownership in GateHouse Media debt prior to a prepackaged bankruptcy and their purchase of Dow Jones Local Media Group from News Corp in September 2013. For me it hits several themes that I like, (1) it's an unwanted spinoff from an investor base that's likely to sell it off, (2) it operates in an out of a favor industry, and (3) it is run by a capital allocation expert (although at a cost). Berkshire Hathaway's Warren Buffett recently purchased 28 local newspapers for $344 million dollars. It's a very small purchase for a $270B+ Berkshire Hathaway, and Warren has a soft spot for newspapers, but he still wouldn't make the purchase if it didn't make economic sense. The industry has value. Local newspapers have a connection to small communities who rely on their hometown newspapers for updates on local schools, sports teams, community politics, and local advertising that's hard to replicate for free. Most people also assume that newspapers are in permanent decline, but I think it's a wrong assumption that the move to digital will permanently lower the revenue and profitability of the newspaper industry. Owners of businesses demand a certain return on investment, and businesses are fairly organic, it may take time, but eventual newspapers will restructure, consolidate, and earn a respectable ROI. Prior to GateHouse Media's bankruptcy, the company had a total of $1.2 billion face amount of debt, majority of which was owned by Fortress/Newcastle. GateHouse Media went into the credit crisis overleveraged and ran into trouble, Newcastle (externally managed by Fortress) grouped together with other debt holders and restructured the company this past November. Newcastle basically dual tracked the purchase of Dow Jones Local Media Group from News Corp (another spinoff and one of my holdings) in September, together with GateHouse Media, to form a new local news media company. Since Newcastle is a REIT, it makes little sense to hold a non real estate operating company like New Media within the restrictive REIT structure, so they decide to spin out the media assets into a new entity. After the spinoff, New Media will have 435 community newspapers, related mobile sites, and 6 yellow page directories. That appears to be just the start, as Fortress has identified nearly $1 billion in potential acquisitions they believe can be purchased at between 2x-5x EBITDA, and then presumably integrated with GateHouse/Local Media, costs cut, resulting in increasing operating leverage. 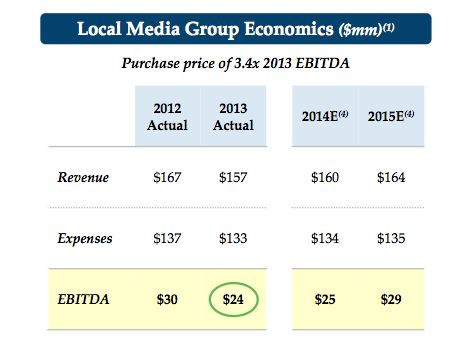 There is a track record here, as Newcastle/Fortress was able to buy Local Media from News Corp at roughly 3.4x EBITDA (after backing out the real estate value). By doing this, Fortress projects they can earn 20-25% unleveraged returns, and 30-35% return on equity with leverage. New Media will also get attention from investors as it plans to pay out a significant portion of their cash flow in the form of a dividend. New Media is unrelated to Newcastle's core business (senior housing REIT, and some legacy CDO debt), there's probably not a lot of shareholder overlap other than those who are loyal to Fortress Investment Group. Newspapers and yellow page directories are an out of favor business that are unpopular and unsexy to discuss at cocktail parties. Unfortunately, I thought there might be more index fund selling due to New Media not being a REIT, but as Newcastle is transitioning from a mortgage REIT to an equity REIT structure, it's not included in the MSCI US REIT Index. But there still might be some REIT focused holders that will be forced to sell New Media in the coming weeks. While revenues have been stabilizing, they're still falling, New Media hopes to reverse the trend with their digital advertising business Propel. I would encourage people to check out their slides on Propel in their recent presentations, but I don't put much value in it. As for a current EV/EBITDA multiple, below are the actual/projected numbers for the two newspaper companies forming New Media, as reported in their initial investor presentation in the fall. 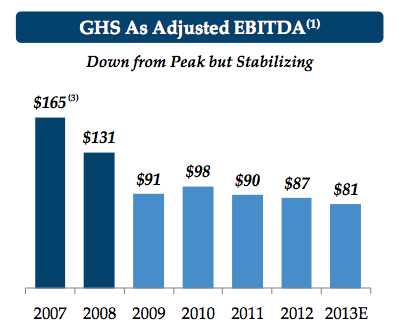 If you combine the two 2013 numbers, you come up with $105 million in EBITDA. New Media has 30,000,000 shares outstanding, based on today's closing price of $12.20 you get a market capitalization of $366 million. New Media took on $185 million in debt after the GateHouse restructuring and the purchase of Local Media Group, making an enterprise value of $551 million, and an EV/EBITDA multiple of a little over 5.2x, definitely cheap, but on the high end of what Fortress thinks they can pay for acquisitions in the industry. I'd like to pay to a little below 5x and that's before the issue of the external management expenses. New Media will be externally managed by Fortress Investment Group, a large private equity/alternative investment manager with little direct expertise with media companies. Fortress is handsomely paid for this arrangement; it receives 1.5% of equity annually and 25% of adjusted profits (adding back depreciation and amortization, among other adjustments) above a 10% hurdle, so you're essentially investing in a cheap media company with a private equity fee wrapper. The advantage of having a private equity fund manage an operating business is the capital allocation, Fortress says they have identified up to $1 billion in potential acquisition targets in the near term, which would almost quadruple the size of the company (and presumably add operating leverage along the way). But external managers have their downsides, (1) the management fee is based on assets which essentially incentivizes them to increase the asset base irrespective of the price they pay for the assets, and (2) the incentive fee may cause the manager to take unnecessary risks as their payoff is skewed to the upside and they don't participate equally in the downside. The benefit usually touted for externally managed REITs is the manager has greater scale and charges the REIT less than what they'd pay internal management. But unlike other externally managed REITs which have limited staff that work directly for the company, New Media has its own operational management team, including a separate CEO, so I'm a little cautious on how this type of model will work in a non-REIT entity. Will the additional costs outweigh the cheapness? Another question I have is around the potential incentive alignments with an acquisition, to me New Media would best be run as a short term vehicle that would later be acquired by a true private equity investor or a larger media company. But its unclear to me how that would benefit Fortress and if they'd really go for it? Yes, they have a decent size equity position, but the fees they earn from keeping New Media as a separate entity far outweigh any premium they would get for their equity in a buyout scenario. New Media has a lot of attributes that I like in a potential investment, but I'm holding off for now to see if it will get cheaper and I'm still trying to get my arms around what discount it should have with an external manager. I'd appreciate any thoughts or comments on New Media, especially around the external manager arrangement, feel free to leave a comment below or email me at clarkstreetvalue@gmail.com. I have another 2-3 ideas that I'll post over the next few weeks, and will probably buy my favorite 1-2 of those. Coastway Bancorp (NASDAQ: CWAY) is the holding company for Coastway Community Bank, a Rhode Island based mutual savings bank that completed its stock conversion on January 14, 2014. The investment thesis is simple and straight forward for Coastway Bancorp (its the same as most any mutual-to-stock conversion): (1) As a mutual conversion, investors essentially get the built up capital "for free" creating an overcapitalized cheap bank, (2) It's balance sheet is fairly clean with limited legacy bad loans, (3) It's trading at an attractive valuation of just under 75% of proforma TBV. Coastway is located and does primarily all of its business through nine banking offices located in Rhode Island, not the most attractive economic environment as its been plagued with higher than average unemployment rates for years. Coastway was a credit union for much of its life before converting to a mutual savings bank in 2009, thus its only recently begun making strides to generate profits. But this is generally an easier problem to fix (compared to say a lot of problem loans) by converting to a stock corporation as management is now incentivized to start generating a profit and can do so by increasing assets and taking a detailed look at expenses. Coastway's balance sheet is pretty clean with $380 million in assets, only a little more than 2% of which are non-performing. With fresh conversion capital at its disposal it should be able to grow the balance sheet to get a closer to point where the regulatory costs become more bearable and spread across a wider base. While many pundits point to this magic number being $1 billion, I think there's still space below that for a bank to succeed and many of the regulatory burdens may end up being less than what the industry originally feared. One thing to like about Coastway is their loan portfolio is more commercial bank like than many savings institutions, less emphasis on one-to-four family residential mortgages and more emphasis on commercial loans. While commercial loans are riskier, it's hard to make money being a traditional thrift in today's low interest rate environment. Expect this trend towards commercial lending to continue at Coastway as they deploy their fresh capital. I also have a soft spot for SBA loans as I think it's a great way for banks to increase their non-interest income (really the driver for bringing down the efficiency ratio and increasing ROA) by originating and servicing the loans, and then selling the guaranteed portions of the loans (at a hefty profit!) into the secondary market, freeing up more lending capacity to rinse and repeat. Coastway despite being either 7th or 8th in deposit share their markets, has been one of the top 3 SBA lenders in Rhode Island for the past six years, hopefully this trend continues. Coastway owns a majority of their bank branches and office space, the book value of which is $24.4 million, a potential hidden asset if these buildings are worth more than their cost minus depreciation (although I haven't looked, would be a minor positive). In fact, they're moving from their current headquarters in Cranston, RI and moving to a new building that's under construction in Warwick, RI. While I typically wouldn't like the sound of a new headquarters being build post IPO, in this instance I hope it makes sense, and signals plans for further growth which is key in a mutual conversion. Coastway has also recently opened up two new branches, combine this with the new headquarters and you also have a lot of one time costs that are masking profitability. Although interest rates have recently pulled back, the longer term trend should be higher as the Federal Reserve reduces its stimulus and forces the markets to fend for themselves. Higher interest rates in general will be a positive for banks as their assets will likely reprice quicker than their deposits/liabilities which are generally sticky (banks will try for as long as possible to keep their deposit rates near zero) and their net interest margins should improve. Coastway is positively leveraged towards higher interest rates, above are the results of a model included in the prospectus that attempts to capture the change in equity value for a given change in interest rates. Coastway, like other mutual conversions, as a limited history with profitability. The efficiency ratio is way too high and the ROA and ROE are both extremely low. Some one time costs around the mutual conversion and expanding their branch network have brought up the efficiency ratio recently, but even in the low 80s (where it's been historically) is too high. But it is a common problem with small mutual conversions, and is actually a fairly easy problem to fix now that they're a public bank with fresh capital to invest. There's likely some low hanging fruit around expense reduction and some positive operating leverage as the asset base should be able to increase without expenses following suit too much. Coastway is also ripe for an activist investor, it's in that sweet spot of small, but still liquid enough for a fund of decent size to accumulate a position and push management. As of today (2/7/14), Coastway has a market capitalization of $50.3 million, versus a book value of $68.6 million after the conversion, or a P/B of 0.73x. As Coastway expands and improves profitability, the discount to book should close producing an attractive return. While the mutual conversion prevents Coastway from being acquired for three years, Coastway will have the opportunity to close the discount to book themselves as they're retaining roughly 40% of the net proceeds from the conversion at the holding company, likely to either fund a dividend or repurchase shares. Overall, there's nothing to jump up and down about over Coastway, it's a pretty typical small community bank that's trading at attractive valuation due to the recent conversion. I have added Coastway Bancorp to my slowly developing mutual bank conversion bucket (along with just Sunnyside Bancorp at the moment), as it's a fairly proven lower risk investment theme.